One of the benefits of traveling with Link Experiences is having the opportunity to expand your senses with these premium products. Choose your favorites! The exceptional quality of the black and milk chocolates of Hoja Verde have been internationally recognized by the Academy of Chocolate Awards for two consecutive years. These chocolates are made with premium organic cocoa beans grown in the tropical lowlands of Ecuador, the most biodiverse country on earth. Ecuadorian cocoa has long been recognized as the world’s finest beans. Its ‘Arriba’ variety brings an unequaled depth in aroma and flavor. Hoja Verde Flowers produces the most astonishing blossoms of the highlands of Ecuador. 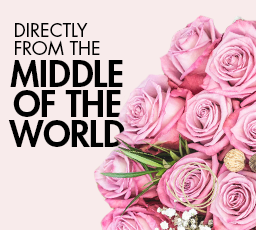 They grow more than 120 types of roses of delicate aroma and breathtaking colors that are coveted all over the world. Their superior quality is the result of an eco-friendly and socially focused business that has been listed as the #1 Ecuadorian Farm for over 15 years. When talking about coffee, Café Vélez is an expert. They are pioneers in Ecuador on promoting coffee culture. With a wide range of flavors and aromas from different communities in Ecuador, their premium beans are selected and roasted with exceptionally high quality standards. Its blends from Loja or The Galapagos Islands are unique in the world. A combination of healthy and unique describe this Ecuadorian based brand. Mira creates avocado gourmet products of premium quality as a result of an eco-friendly process. Their star products include natural oils, macerated with chili peppers, lemon, garlic and added avocado leaves. They are definitely one of a kind. You can take Ecuador wherever you go by complementing your outfit with these beautiful handmade accessories. The natural fiber of great finesse that Jute Bags and Straw Hats are made of or the unique and exclusive look that Tagua Jewelry and Hand Embroidered Clothes evoke, definitely gives your style that natural touch that makes the difference. In order to reach our commitment with social responsibility we have decided to partner up with World Vision, an NGO that fights for a better future. Its program “La Violeta” helps young people who are in high situations of vulnerability in the province of Imbabura, Ecuador. We share their wish of a society built in justice; pulling up the roots of poverty and planting the seeds of change. You can also be part of this initiative. 10% to La Violeta Program. World Vision is a Christian humanitarian organization working to help communities lift themselves out of poverty. They are called to serve the people in great need around the world, to relieve their suffering and to promote the transformation of their condition of life. World Vision stands in solidarity in a common search for justice and seeks to understand the situation of the poor, working alongside them toward fullness of life. When you go too far for the vulnerable and the ignored, beautiful things happen. They also fight to facilitate an engagement between the poor and the affluent that opens both sides to transformation. They respect the poor as active participants, not passive recipients, in this relationship. Together, they share a quest for justice, peace, reconciliation, and healing in a broken world. This project aims to contribute the development of skills and provide knowledge to highly vulnerable young people belonging to indigenous communities in the province of Imbabura. With the appropriate tools, these human beings can effectively exercise the task of becoming agents of change in their local contexts, generating and executing initiatives that transform the reality of their communities. The development of skills and knowledge is based on offering young high school graduates in poverty or extreme poverty, intensive pre-university education under the modality of boarding school. Classes that take place in the facilities of the Training Center "La Violeta", belonging to World Vision Ecuador, located in the city of Ibarra. This way, they have the opportunity to academically prepare themselves in order to achieve the score required by the Ecuadorian government to enter a higher education institution and go in post of their dreams of becoming professionals. Finally, the project provides intercultural spaces of mutual transformation among different social actors like external partners, local government, young adults and community leaders, exchanging and transferring knowledge to learn through fairs and training workshops. This way they participate in the dialogue and the construction of a more just and secure society. Please, fill out this form. We’ll contact you for a personalized service experience. Wholesale prices for roasted coffee. Imported from Ecuador growers direct to US distributors, suppliers, and retailers in the US looking to buy quality bulk roasted coffee online. At Sense Ecuador, we only work with USDA certified farmers of different regions of Ecuador that produce specialty coffee of delightful aroma and flavor. Whether you are a small coffee shop, a specialty store or a wholesaler that requires premium blends, we have a range of technological and commercial alternatives for your business to receive the best coffee from Ecuador. If you’ve been looking for altitude coffee, reach out to us and receive an exclusive discount on your wholesale order.